Review: Those Maltese bad boys Owen Jay and Melchior Sultana are back on their trusty Batti Batti steed with another sublime drift through velvety-smooth deep house cuts for discerning heads. "August" lays the pads on thick, making the groove all that sharper when they drop out, but it's not long before that filter opens back up to let the blissful tones back into the mix. As the name suggests "Acid Carpaccio" is a rougher concern, but it's still finished off with a classy finish and one eye on the deep end of the dance. "Smoked" notches up the swing and aims skywards with an uplifting, contemplative jam like this formidable duo have forged their name on. Review: Owen Jay's Batti Batti label has carried a great selection of various artists releases throughout its back catalogue, and the tradition continues with this latest missive. 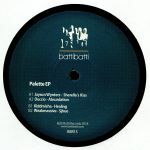 The Palette EP kicks off with the ever-rising talents of Jayson Wynters, who plies a seductive strain of deep house on "Sherella's Kiss" that melts perfectly into the blissful, twinkling keys and gossamer percussion of Duccio's "Absurdation". Kiddmisha leads in on the B side with the sprightly electro of "Healing" before Weakmassive rounds things off with the mellow acid of "Sjhue," which matches a nagging 303 with sumptuous keys for a spine-tingling conclusion to a fantastic 12".